Surprisingly, our friend Zottel was released from imprisonment on remand in Görlitz yesterday. He was one of the two activists who were arrested after the eviction of LAUtonomia because of a lock-on-action during the Ende-Gelände action days. We still don’t know the reasons for his release. 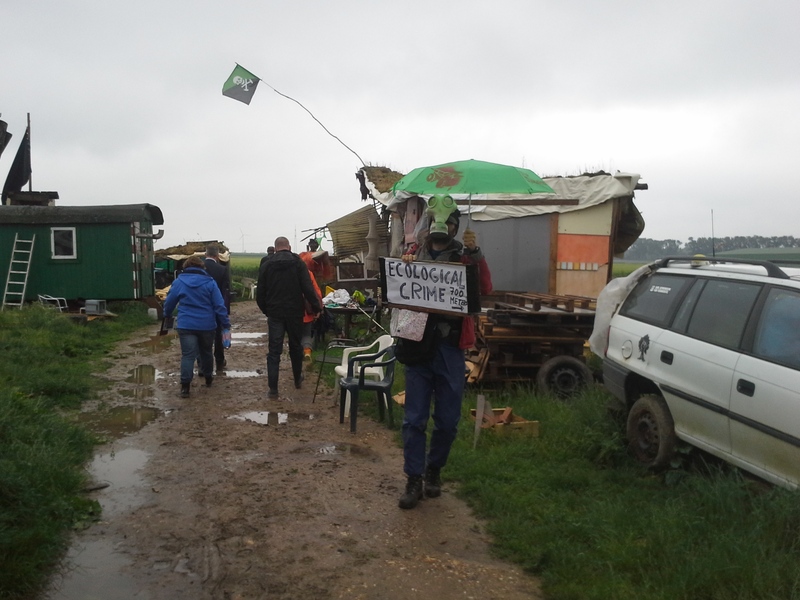 The imprisonment of the two activists after the eviction was a new development in the repression against the climate movement. For the first time, imprisonment on remand was used although their identities were clear. Zottel is free now, but the activist who was arrested with him and our friends Yu and Turtle are still imprisoned. 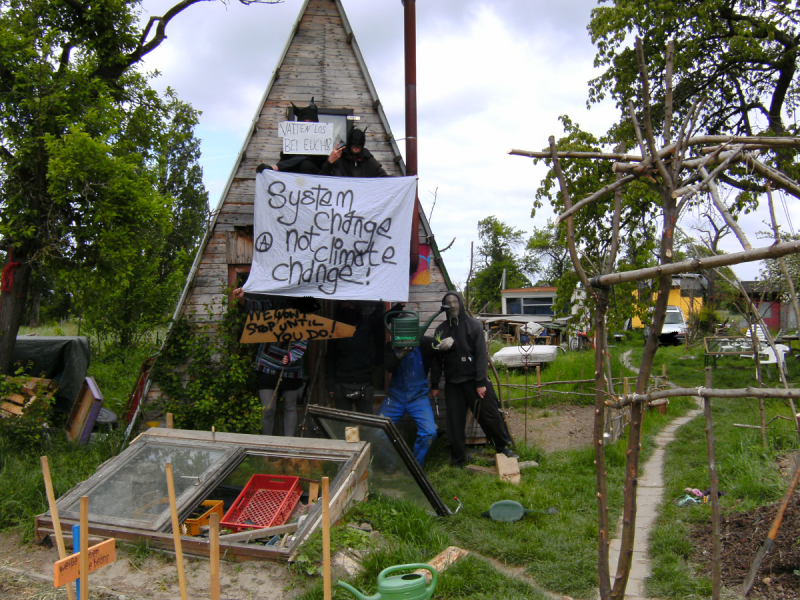 “July 13-17: Sustaining our activism – Training in The Netherlands (in English). This workshop is for anyone who is active for social change. Surrounded by nature we will have time to reflect and get nourished. We will explore tools and strategies for finding inspiration and ways through the ups and downs in the struggle. We will explore and experience tools for our personal as our collective sustainability. It want to support you, to keep us going for the long haul. The workshop will take place in a simple location in the North East of the Netherlands. More details below. Since December 2010 they have in Bolivia the unique “Law on the Rights of Mother Earth”. It gives to our planet – as a living system – rights in the same rank as the Human Rights. The indigenous population of this mountainous country has always known how sensitive the Earth is, whom we are all dependent on. That’s why they call her reverently Mother Earth: Pachamama. The current government is the first that recognizes and values the culture, belief and rights of the indigenous people. The exercise of individual rights of is limited by the exercise of collective rights in the life systems of Mother Earth. Any conflict between the rights must be solved in a way that these do not affect irreversibly the functionality of the living systems. The rights of the life systems (Mother Earth) therefore have priority. With such a law in Germany for example, open-cast mining would be unlawful because it damages the “functionality of the living systems” forever. Coming soon … At the meadow occupation Hambacher Forst from 13. until 19. July we wanna have a colorful time with art and culture, with resistance and action. Let’s enjoy some workshops, music, building, poetry slam and much more. But to fill the time and space we need your help: Bring whatever you like, give your knowledge to other persons or fill the air with music and juggling stuff. Show us the art you are making. Bring food or your cooking skills. Mind: Everyone is welcome. The camp has an emancipatory and command-free claim ! 5/21/2016. The alliance Ende Gelände demands the release of four activists who were arrested in the context of actions during the Pentecost weekend, May 13-15. About 3,500 people had blocked in an action of civil disobedience, the Schwarze Pumpe power plant. The police operation during the mass action was largely de-escalating. However, the Alliance criticizes the disproportionate crackdown on involved individuals and small groups; and unacceptable conditions of detention of activists. 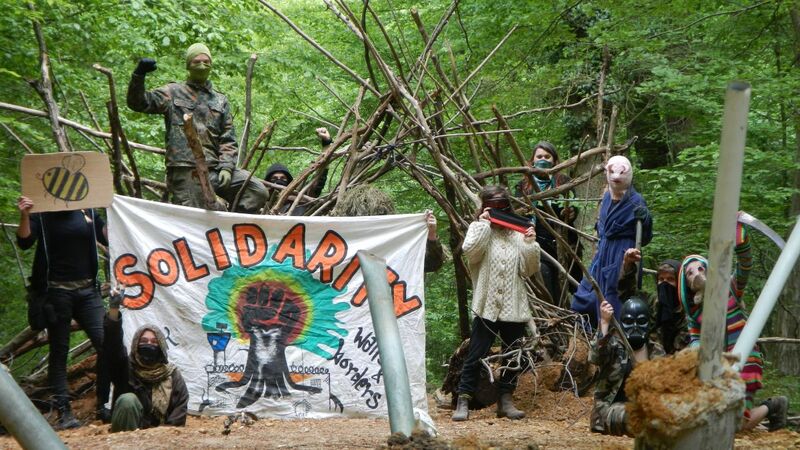 Today, May 18th 2016, the Forest occupation in the Lusatian lignite mining area is cleared by the police. The occupation has existed since the beginning of March 2016. The Lusatian lignite mining area near Cottbus / Brandenburg is operated by the energy company Vattenfall and is one of the 4 lignite coalfields located in Germany. The tree occupations in Lusatia and Rhineland are allegedly obstacles to further grubbing works, related to the expansion of the opencast mines. We can not consider this struggle just from our perspective – many other people and groups are active on our side. 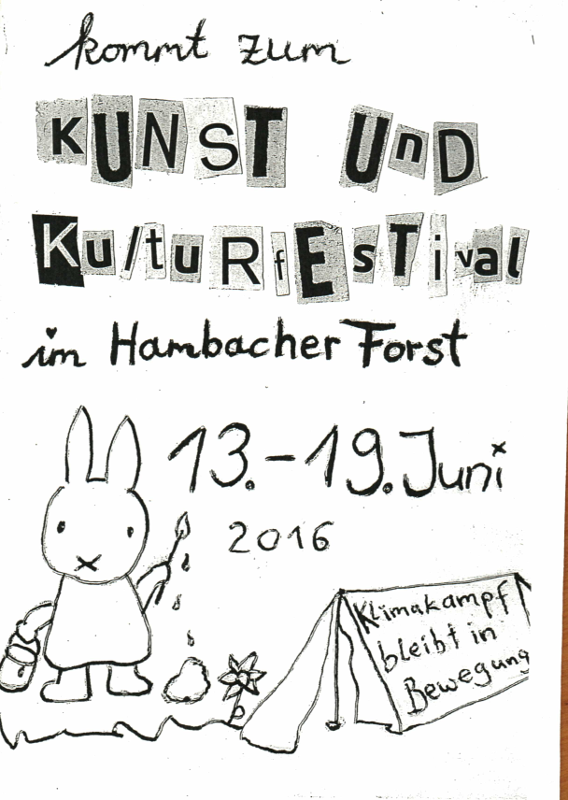 On the meadow occupation against the extraction of lignite will take place from June 13th to 19th the second “Art & Culture Festival”. You are very welcome. In parallel with the Climate Camp, which is being held for already a week in Lusatia, currently the Action Days are taking place. 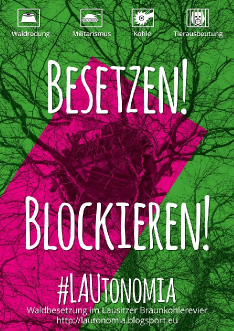 In the Lusatian lignite mining area, which is operated by Vattenfall, the production and conversion of lignite is paralysed by actions for meanwhile three days.